Gonzaga’s third-place performance at the PK80 impressed some college basketball poll voters. The Zags (5-1) moved up to No. 15 in Monday’s AP rankings following their 2-1 record at the PK80, which honored Phil Knight’s 80th birthday. Gonzaga jumped from 17th to 14th in the USA Today poll. 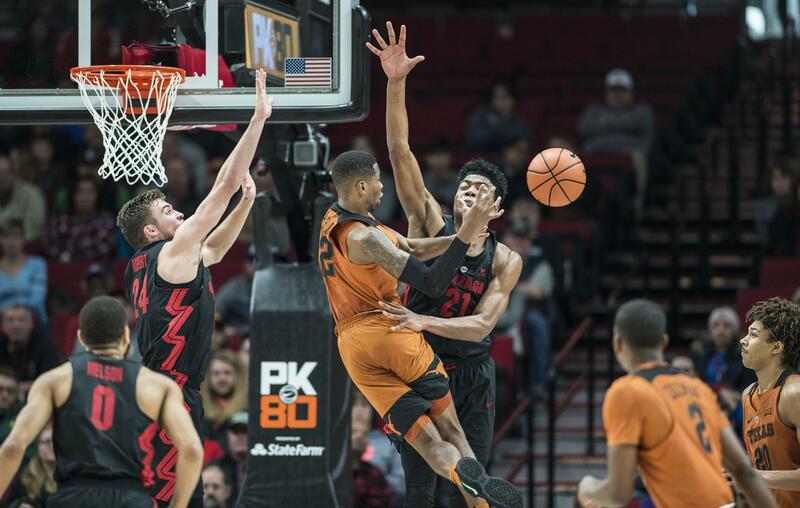 Gonzaga blew out Ohio State and edged Texas in overtime, but it was Friday’s thrilling 111-105 double-overtime loss to Florida that probably influenced the voters. Florida blew a double-digit lead in the second half and lost to No. 1 Duke in the championship game of the Motion Bracket, but the Gators still gained one spot in the AP poll to No. 6. Duke, which trailed at half in all three PK80 games, garnered all 65 first-place votes to strengthen its hold on No. 1. Saint Mary’s, ranked No. 21 last week, dropped two games at the Wooden Legacy and plummeted out of the top 25. The Gaels received five votes. Washington State (6-0), which defeated Saint Mary’s en route to winning the Wooden Legacy, earned 31 votes, sixth most among teams outside the top 25. No. 2 Kansas, No. 3 Michigan State and No. 4 Villanova all climbed one spot. Gonzaga and Villanova meet on Dec. 5 in the Jimmy V Classic at Madison Square Garden in New York City. Creighton (5-1), which visits Gonzaga on Friday, entered the rankings at No. 25. Notre Dame, which defeated Wichita State in the Maui Invitational title game, soared from No. 13 to No. 5. Florida, Kentucky, Wichita State, Texas A&M and Miami rounded out the top 10. Gonzaga, with 666 votes, trails No. 14 USC by 14. Arizona became the first team since Louisville 31 years ago to slide from No. 2 to out of the rankings in one week. The Wildcats went 0-3 at the Battle 4 Atlantis. The Wildcats had been in every AP poll since the beginning of the 2012-13 season. Published: Nov. 27, 2017, 10:17 a.m. Updated: Nov. 27, 2017, 11:15 a.m.